The April 6th date on our registration site is the last date of all music auditions/interviews. An automatic reply giving you the April 6th date will be sent to you but is not necessarily the date you will be given for your audition. Applicants who are not able to book and pay for an audition using our online system should contact ovandeli@uwo.ca to request a paper (by mail or in person) or PDF (by email) form. 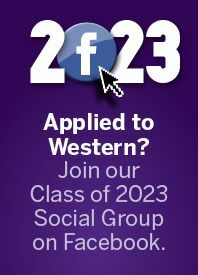 If submitting a form by mail, cheques or money orders should be made payable to Western University. Payment must be received before an audition or interview can be scheduled (regardless of whether the applicant chooses to bring their own accompanist or use a provided accompanist). Two Letter of Recommendation forms should be sent to us directly. If the person completing your Letter of Recommendation is unable to complete the form online, contact ovandeli@uwo.ca to request a paper (by mail or in person) or PDF (by email) form.